1. Music is a Science. 3. Music is a Foreign Language. 5. Music is Physical Education. 6. Music Develops Insight and Demands Research. 7. Music is all these things, but most of all, Music is Art. more gentleness, more good-in short, more LIFE. Come join us and discover your child’s potential in Suzuki Early Childhood Education (ECE) & Baby Music class. wanting to progress where they left off. 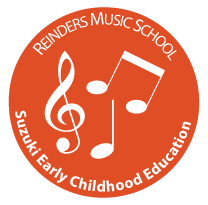 The Reinders Music School (RMS) is a private music school based in Mill Hill, London, United Kingdom. The RMS provides with many different aspects of the studying of music. There is a preparation stage for the very early young age with the Music & Movement base on Suzuki Method for level 1 and 2 from age 3.5 to 5 years old that introduces music with games, movements and songs. The Suzuki Method International that is teaching children as early of 3 ½ or 4 years old in piano playing that learn by developing the sound language recognition, the movement of the fingers and the right seating piano position. All the songs are teaching by listening and imitating the teacher fingers movements. Games and stories of the repertoire songs are part of the teaching for the very young. RSM caters for all regardless of age, level and knowledge as well as prepares students for examinations in all the international recognized boards of music. RSM provides tuition in the following: piano, theory, harmony, music analysis, solffegi, history of music and exams. Trinity College of Music, Associated Board of the Royal Schools of Music Guildhall School of Music. The Reinders Music School organizes concerts, workshops and parents lectures. Pupils are entered in Suzuki International workshops, concerts and extra activities. So, whether you are a serious or amateur musician with a specific requirement, or a parent looking to enrol your child, we would like to hear from you.